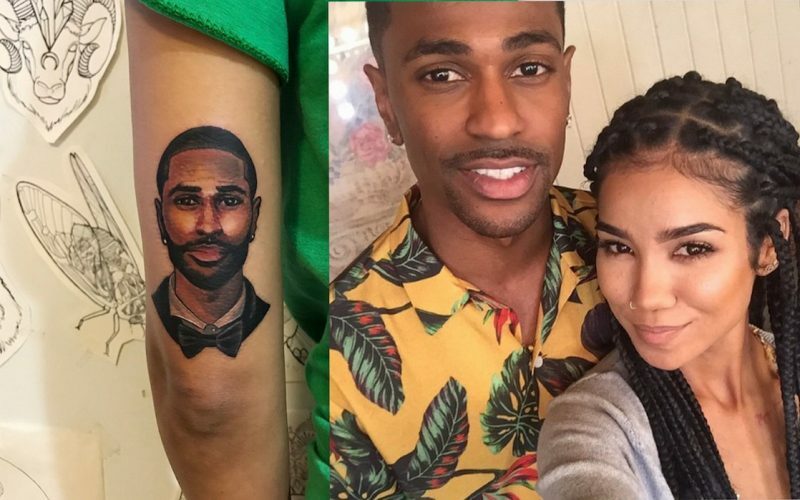 Jhene Aiko celebrates divorce with a giant tattoo of her boyfriend Big Sean. The R&B singer recently finalized her divorce from producer Dot Da Genius paving the way for her to get more serious with Big Sean whom she has been dating for the past year. The large tattoo is a portrait of Big Sean wearing a tux a beard and diamond earrings. The ink was done by famous Los Angeles tattoo artist Miryam “The Witchdoctor” Lumpini. Miryam posted two photos of the tattoo on Instagram on Monday. Jhene Aiko and Big Sean went public with their relationship last year when they kissed on stage. The next week she announced her split from Dot Da Genius whom she was married to for 11 months prior to their split. Their divorce was finalized last week paving the way for her to get this tattoo as a slap in the producer’s face. The real winner in this situation is Big Sean because he has no tattoos of her, at least none that the public is aware of.